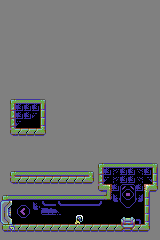 Hi, I wanted to give a try at the C64 colour palette for a while, but was a bit intimidated by it. I have to point that Ptoing's nifty document was the perfect companion since this palette so hard to understand. 8x8 tiles. I'm shooting for a 2x/4x zoom. Must have a lot of issues there, feel free to point them. I'm glad you have the high-contrast edges on the gray floors, and the brown-to-blue ramp on the metal(?) tiles looks very nice. I'm guessing the clouds and buildings are still WIP, so other than those, it looks really good. Some of the brown might need a bit of depth, though. Yep the background is still WIP but I would like to keep it simple, my main concern will be the readability of the foreground elements. It's supposed to be more of a square-ish mountain. Wonder how to convey the scale, perhaps another layer in the back ? Perhaps adding flora to it ? I did a super quick proto. Arrows for movement,"X" to jump. Nice mockup, but the character isn't really distinguishable from the background. (But at least it's readable.) How about having the outlines you had reserved for the "canon" rounds switched over to surround the character? pistachio <> thanks, I tried an outline on all the foreground elements, a bit easy as a problem solver ... I think I was getting lost design wise. If the game is scaled it makes more sense for me to go with plain shapes. I will make a "proper" game design document as a guide. Seiseki <> hehe, not my intention but could be nice. The whole A-team would be a nice challenge ! Modified the platform tileset, and added some flames. I picture the character running away from some cataclysmic event, thus the flames constrain him in the playfield. He could be forced to run all the time as he's totally out of his mind. Perhaps running away from the flames if he gets to close to them. Could be fun to draw and animate the FXs in such a setting. also, started to work on a logo, mainly inspired by this piece by Helm. much improved character readability. Couldn't tell what the blocky obstacles on the ground are, though. Thanks, PypeBros. It was some random elements. I worked on a speudo story/gamedesign, I hope it will help me design wise to have some kind of story telling going on. So it's about a lost astronaut who explores a cavern on a far away planet. Mainly going down and vertical only scrolling. Metroid is THE big influence here and Portal regarding the evolving setting. I wanted to start with a rusty abandoned facility/laboratory and introduce more flora later gradually. At the beginning most of the enemies will be the robots from the facility, lots of them are working or just passing by, a few will be security ones. Each level will contain around 3/5 rooms. The player is spawing on a teleporter and has to reach the other one to continue to next level. So it's about a lost astronaut who explores a cavern on a far away planet. Mainly going down and vertical only scrolling. Going deeper and deeper up to the point they've awaken forgotten things that should have been kept sleeping for eternity... familiar ... and that makes me eager to try esp. in a scifi setting. As for the black background, I'd suggest you "spice it up" will low-contrast details such as pipes and similar tech things. Arne's mockup of a revived version of Manic Miner Jet Set Willy could be inspiring (that's what I'd have in mind as reference, at least). hehe, perhaps, who knows ? I'm not a coder but I will try to build a basic proto to test the graphics. Good point with that image. Tried something for the background, went a bit to far perhaps, now onto the background/foreground connections.